Commercial Postboxes are defined as letterboxes that can be banked together to form a multi-occupancy mailbox system. Typically they are either landscape (horizontal) or portrait (vertical) in style, each has it's own benefits and depends on your specific requirements. Next, consider whether you would like to retrieve your mail from the front of the box or the rear, this will often be determined by your choice of mounting the mail box unit. These options include surface mounting, through the wall fixing or free standing post box units which are installed on a stand. These postboxes are available as individual mail boxes, alternatively they can be supplied as a complete bank of multi-occupancy letterboxes. For the DIY enthusiast these post boxes can simply be mounted onto a wall individually butted up against each other to form a mailbox unit, each box comes with wall fixings. These boxes can be bolted together or simply riveted, they are all made from powder coated galvanised steel and are suitable for installing outside. If you would like any advice regarding these boxes please contact us. Through the wall postbox mail chutes are a great way to receive your mail through a sold structure. These mail chutes are often used where a house or business has a secure perimeter fence or wall and there seems little point in opening that up just to receive your post so a mail chute can be built into a wall, it is possible to retro-fit these mail chutes but we would advise getting a quote from a builder before you purchase your mail chute. These post boxes are banked together to form one single unit and can be set into concrete, alternatively they can be bolted into a solid surface using the optional feet. These letter box units are made from powder coated galvanised steel and can be installed outside making them perfect for schools, universities, business units and multi occupancy flats and housing complexes. Additional keys and spare locks are available and so these postboxes are perfect for universities when spare parts and additional post box keys might be needed! These Postboxes are assembled into a bank of letterboxes and can be set into a wall or timber frame. Each unit can be supplied with or without a frame around the edge. By adding a postbox frame you ensure the edge of the recessed unit always looks nicely finished and it reduces the need to cut a perfect hole to house the unit. Recessed postbox units can be supplied in many different configurations and are available in all standard RAL colours as well as stainless steel. Surface mounted postboxes are designed to be fixed directly onto a wall or other flat surface. They are available in a horizontal or vertical style box and come supplied with fixings. These postbox units are available with a choice of frames and are available in all standard RAL colours as well as stainless steel. Additional postbox keys are available and the doors and locks can be replaced individually. Door side postbox panels are becoming increasing popular especially in combination with housing construction. No entering of the house by external delivery services, little space for vandalism, minimised noise disturbance, convenient post removal, no thermal bridges broken because of integrated insulation – all these reasons are advantages for this mailbox bank type. These postbox units are available in all standard RAL colours as well as stainless steel. Fence and railings mounted postboxes can be incorporated into an existing fence or set of railings, the postbox units can be supplied with an additional frame to fix into the existing structure. 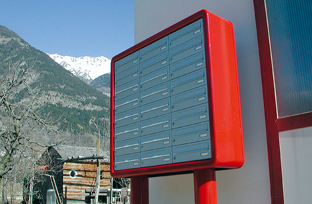 The post boxes can be front or rear mail retrieval and can be supplied in either a vertical or horizontal format. They are available in all standard RAL colours as well as stainless steel, these boxes can also incorporate engraving for house or flat numbers.